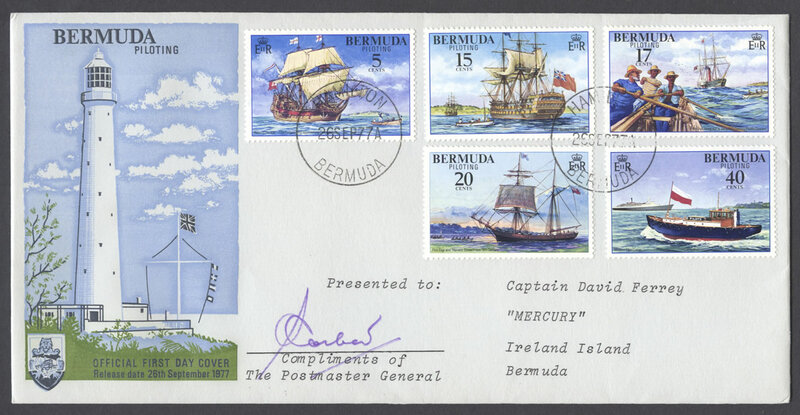 Stamps: 5c Heaving the lead – 17th Century Ship approaching Castle Island; 15c King’s pilot leaving ship – 1795; 17c Pilot Gigs racing out to 19th Century Paddle Steamer, 20c Pilot Gigs and “Harvest Queen” – late 19th Century; and 40c Modern Pilot Cutter. 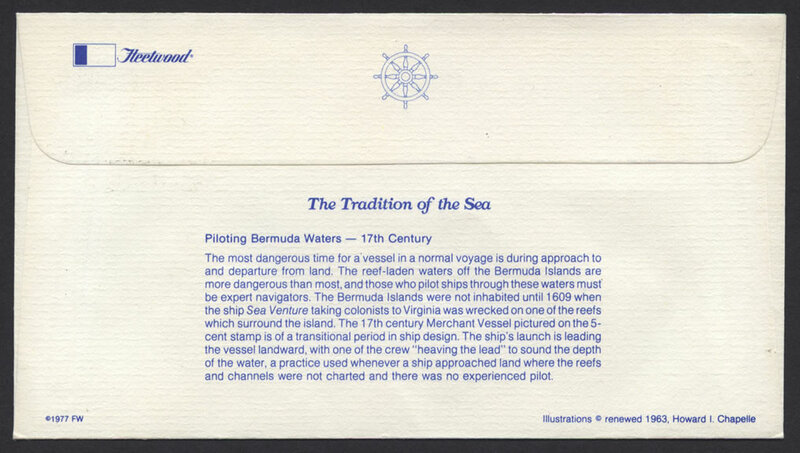 The system of piloting in Bermuda has developed over many centuries and the number of wrecks in Bermudian coastal waters bears testimony to the continual need for this service. Even in the distant past when ships were far smaller than the modern passenger and cargo vessels the dangers awaiting unwary, inexperienced or perhaps just unlucky navigators were fully appreciated. 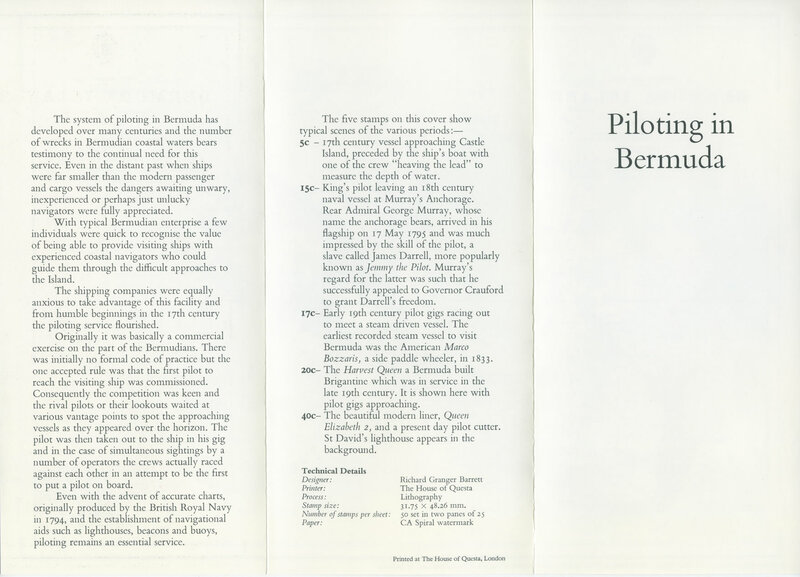 With typical Bermudian enterprise a few individuals were quick to recognise the value of being able to provide visiting ships with experienced coastal navigators who could guide them through the difficult approaches to the Island. 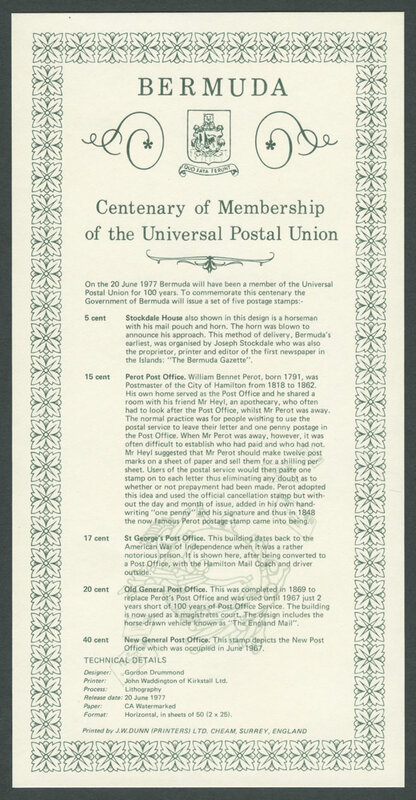 The shipping companies were equally anxious to take advantage of this facility and from humble beginnings in the 17th century the piloting service flourished. 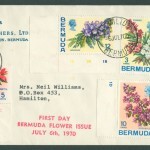 Originally it was basically a commercial exercise on the part of the Bermudians. 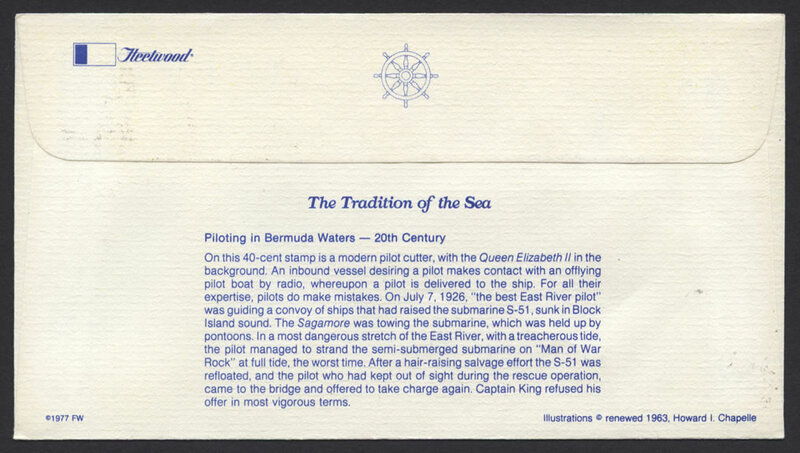 There was initially no formal code of practice but the one accepted rule was that the first pilot to reach the visiting ship was commissioned. Consequently the competition was keen and the rival pilots or their lookouts waited at various vantage points to spot the approaching vessels as they appeared over the horizon. 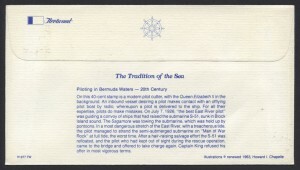 The pilot was then taken out to the ship in his gig and in the case of simultaneous sightings by a number of operators the crews actually raced against each other in an attempt to be the first to put a pilot on board. Even with the advent of accurate charts, originally produced by the British Royal Navy in 1794, and the establishment of navigational aids such as lighthouses, beacons and buoys, piloting remains an essential service. 5c – 17th century vessel approaching Castle Island, preceded by the ship’s boat with one of the crew “heaving the lead” to measure the depth of water. 15c – King’s pilot leaving an 18th century naval vessel at Murray’s Anchorage. 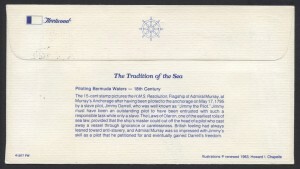 Rear Admiral George Murray, whose name the anchorage bears, arrived in his flagship on 17 May 1795 and was much impressed by the skill of the pilot, a slave called James Darrell, more popularly known as Jemmy the Pilot. 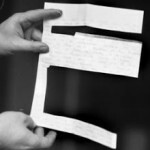 Murray’s regard for the latter was such that he successfully appealed to Governor Crauford to grant Darrell’s freedom. 17c – Early 19th century pilot gigs racing out to meet a steam driven vessel. 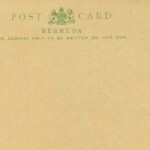 The earliest recorded steam vessel to visit Bermuda was the American Marco Bozzaris, a side paddle wheeler, in 1833. 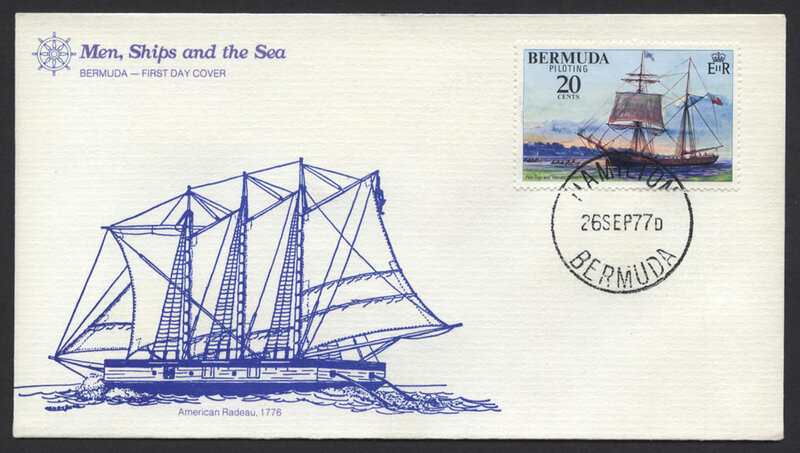 20c – The Harvest Queen, a Bermuda built Brigantine which was in service in the late 19th century. It is shown here with pilot gigs approaching. 4oc – The beautiful modern liner, Queen Elizabeth 2, and a present day pilot cutter. St David’s lighthouse appears in the background. 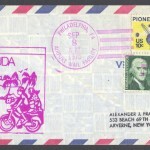 Stamp size: 31.75 x 48.26 mm. 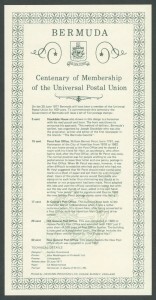 Text: Produced from portions of BA Chart No 334 with the sanction of the Controller, HM Stationery Office, and of the Hydrographer of the Navy. 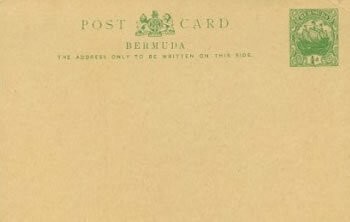 Bermuda pilot gigs were long, slender craft, their lengths ranging between 32 teet and 42 feet, and most of them were built on St. Davids Island by Island craftsmen. They carried a crew of 6 or 8 oarsmen and could be rigged with 2 or 3 loose-footed leg-of-mutton sails and a jib. This allowed them a variety of choices without reefing according to the strength ot the wind, and they were capable ot incredible speeds, 14 knots having been recorded. 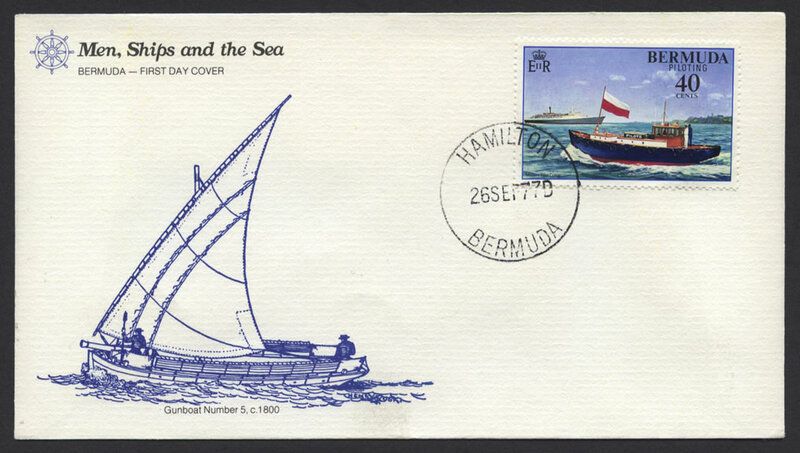 The gig on this cover “RAMBLER”, is the last ot the Bermuda pilot gigs, and can be seen at the Maritime Museum at the Keep Yard, Ireland Island, Bermuda. 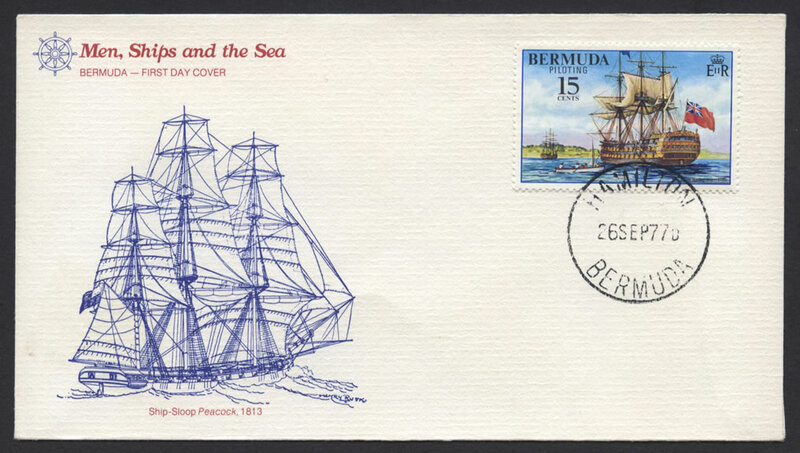 The 17 cent stamp shows pilot gigs racing out to the first steam driven vessel to arrive in Bermuda, the side paddle wheel ship “Marco Bozzaris” – 1833. 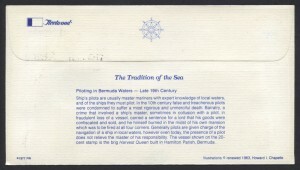 The 20 cent stamp shows pilot gigs approaching the Bermuda built brig “Harvest Queen” built in Hamilton Parish – late 19th century. Line drawing of “RAMBLER” by Bronson Hartley, Esq. 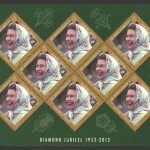 Printing by Island Press Limited. 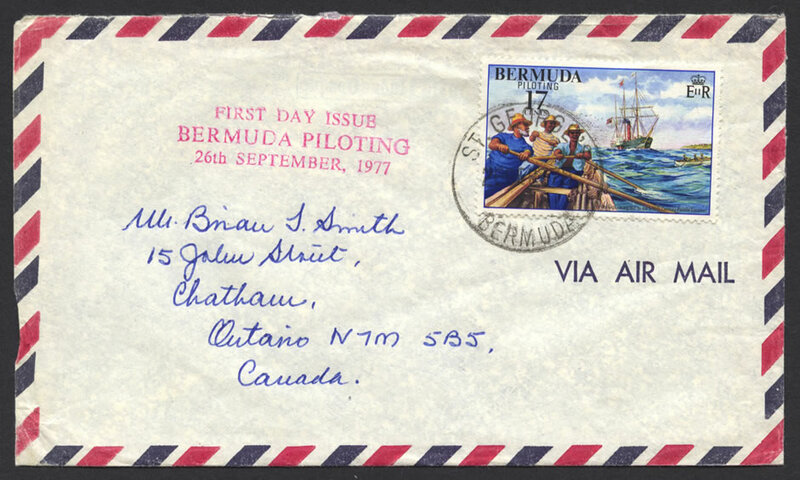 All proceeds from sales of this first day cover to go to the Bermuda Maritime Museum. The most dangerous time for a vessel in a normal voyage is during approach to and departure from land. 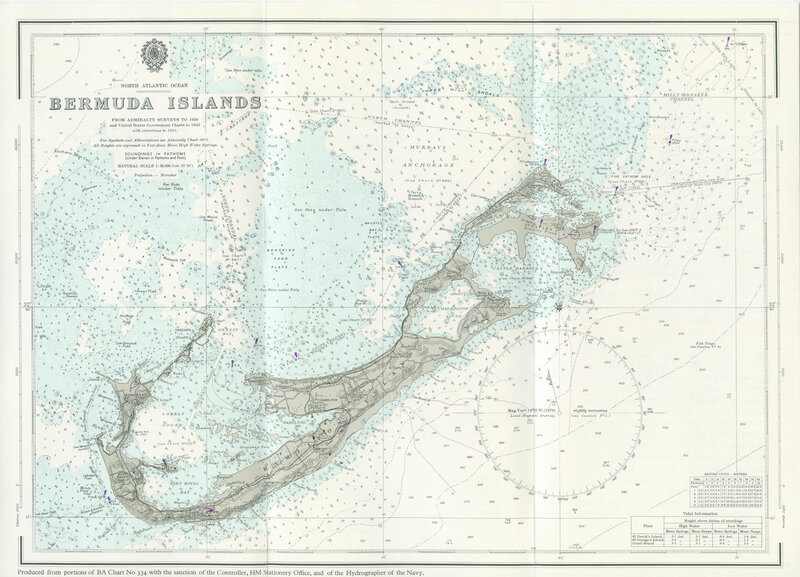 The reef-laden waters off the Bermuda Islands are more dangerous than most, and those who pilot ships through these waters must be expert navigators. The Bermuda Islands were not inhabited until 1609 when the ship Sea Venture taking colonists to Virginia was wrecked on one of the reefs which surround the Island. 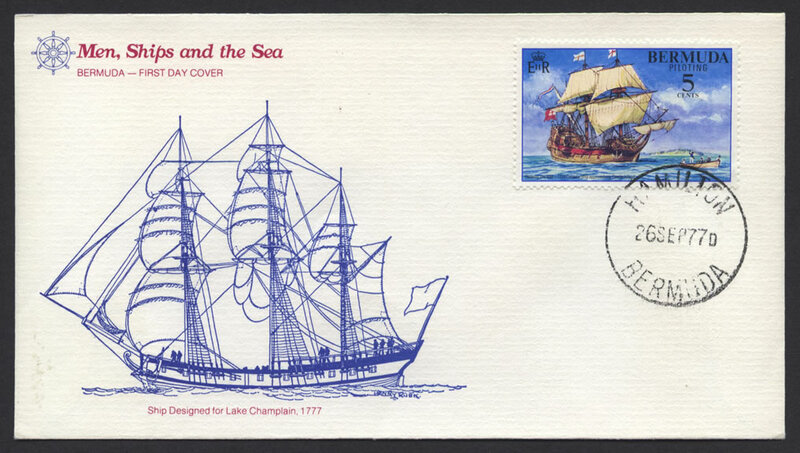 The 17th century Merchant Vessel pictured on the 5-cent stamp is of a transitional period in ship design. The ship’s launch is leading the vessel landward, with one of the crew “heaving the lead” to sound the depth of the water. 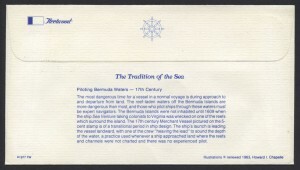 a practice used whenever a ship approached land where the reefs and channels were not charted and there was no experienced pilot. 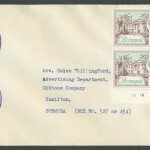 The 15-cent stamp pictures the H.M.S. Resolution, Flagship of Admiral Murray, at Murray’s Anchorage after having been piloted to the anchorage on May 17, 1795 by a slave pilot, Jimmy Darrell, who was well known as “Jimmy the Pilot.” Jimmy must have been an outstanding pilot to have been entrusted with such a responsible task while only a slave. The Laws of Oleron. 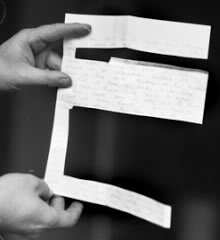 one of the earliest rolls of sea law, provided that the ship’s master could cut off the head of a pilot who cast away a vessel through ignorance or carelessness. 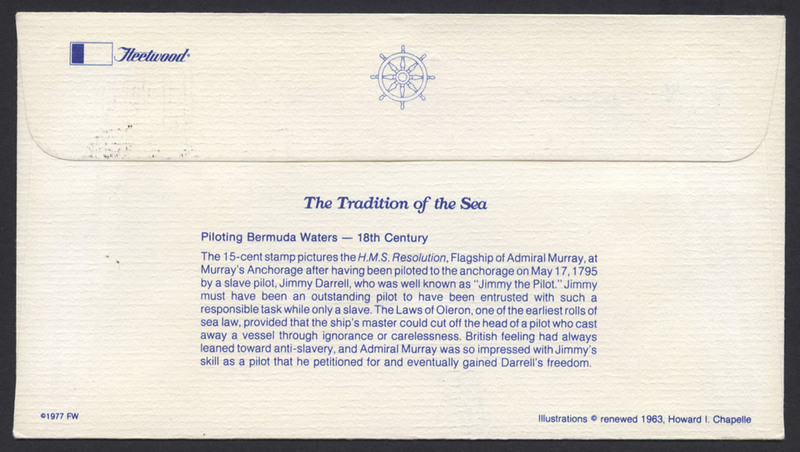 British feeling had always leaned toward anti-slavery, and Admiral Murray was so impressed with Jimmy’s skill as a pilot that he petitioned for and eventually gained Darrell’s freedom. 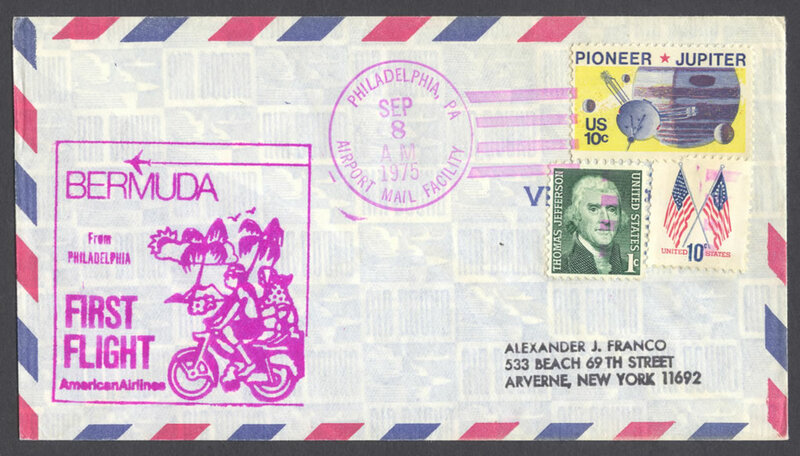 This 17-cent stamp focuses on a facet of the 17th century pilot’s rules which allowed that the “first pilot aboard received the contract to guide the ship to shore.” This rule led to fierce competition as the pilots raced each other to be the first aboard. 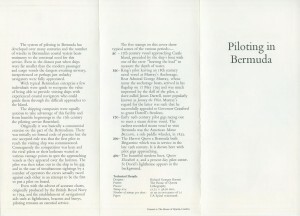 Eventually the Bermuda Government placed a set of controls upon the pilots, and brought order and safety to what had developed into an unruly contest. The ship to which the pilot gigs are shown racing, is the first steam driven vessel to arrive in Bermuda, the side-paddle wheel ship Marco Bozzaris built in 1833. Ocean going paddle steamers had great difficulty steering a straight course In heavy weather, since, as the ship rolled, one or another paddle would be out of the water. To avoid this, many ships were equipped with reefing paddles which could be folded or lifted out of the water. Ship’s pilots are usually master mariners with expert knowledge of local waters, and of the ships they must pilot. In the 10th century false and treacherous pilots were condemned to suffer a most rigorous and unmerciful death Barratry, a crime that Involved a ship’s master, sometimes in collusion with a pilot, in fraudulent loss of a vessel, carried a sentence for a lord that his goods were confiscated and sold, and he himself burned in the midst of his own mansion which was to be fired at all four corners. 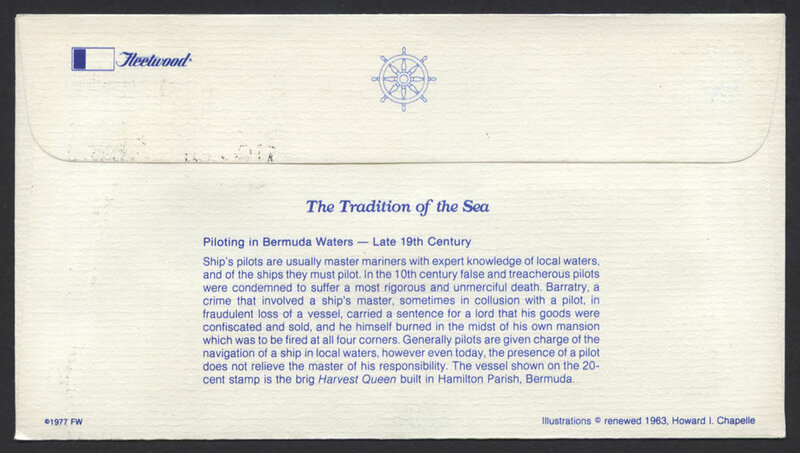 Generally pilots are given charge of the navigation of a ship in local waters, however even today, the presence of a pilot does not relieve the master of his responsibility. 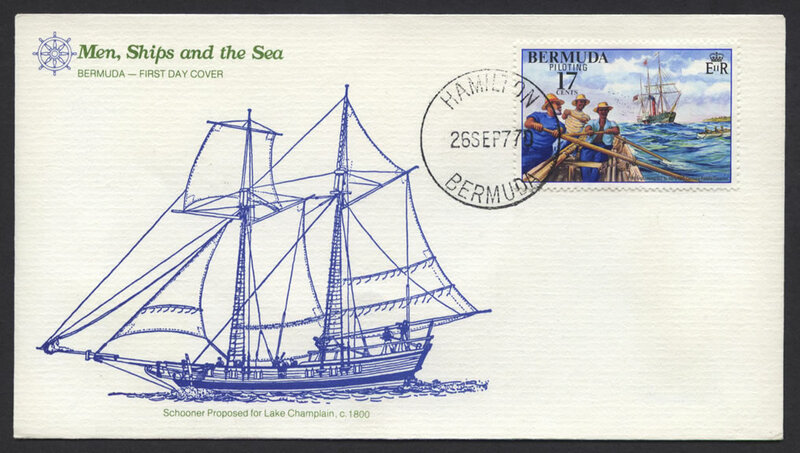 The vessel shown on the 20-cent stamp is the brig Harvest Queen built in Hamilton Parish, Bermuda. 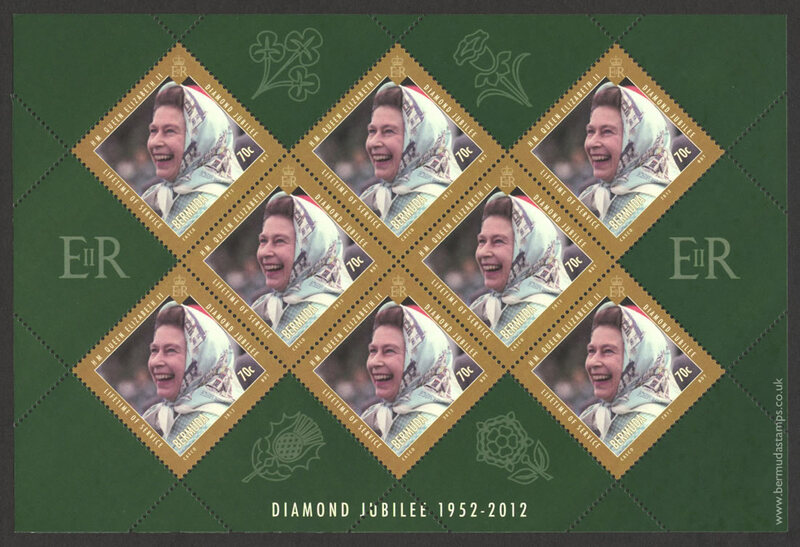 On this 40-cent stamp is a modern pilot cutter, with the Queen Elizabeth II in the background. An inbound vessel desiring a pilot makes contact with an offlying pilot boat by radio, whereupon a pilot is delivered to the ship. For all their expertise, pilots do make mistakes. On July 7, 1926, “the best East River pilot” was guiding a convoy of ships that had raised the submarine S-51, sunk in Block Island sound. The Sagamore was towing the submarine, which was held up by pontoons. In a most dangerous stretch of the East River, with a treacherous tide, the pilot managed to strand the semi-submerged submarine on “Man 0′ War Rock” at full tide, the worst time. Alter a hair-raising salvage effort the S-51 was refloated, and the pilot who had kept out of sight during the rescue operation, came to the bridge and offered to take charge again. Captain King refused his offer in most vigorous terms.